Proposed Rezoning of Canarsie, Brooklyn. Plan downzones most of Canarsie; concentrates increased density along commercial corridors. Despite some resident criticism, the City Council approved the 250-block rezoning plan for Canarsie, Brooklyn. The rezoned area is generally bounded by Foster Avenue, Fresh Creek Basin, Paerdegat Basin, and the Belt Parkway and Seaview Avenue. Concerned over the loss of single- family and two-family homes, Canarsie residents asked the Department of City Planning to develop a zoning plan that more closely matched the area’s low-density building scale. Planning’s final proposal called for six lower density and contextual zoning districts — R3-1, R3X, R4A, R4-1, R5D and R5B — to primarily replace the area’s R4 and R5 zoning. The plan concentrated the higher density R5D districts along Canarsie’s established commercial corridors, including Flatlands Avenue and portions of Rockaway Parkway. Planning also proposed to decrease the depth of the existing commercial overlays from 150 to 100 feet to reduce encroachment of commercial uses onto residential blocks. The Subcommittee and Land Use Committee voted to approve the plan without change. The full Council then approved on June 30, 2009. 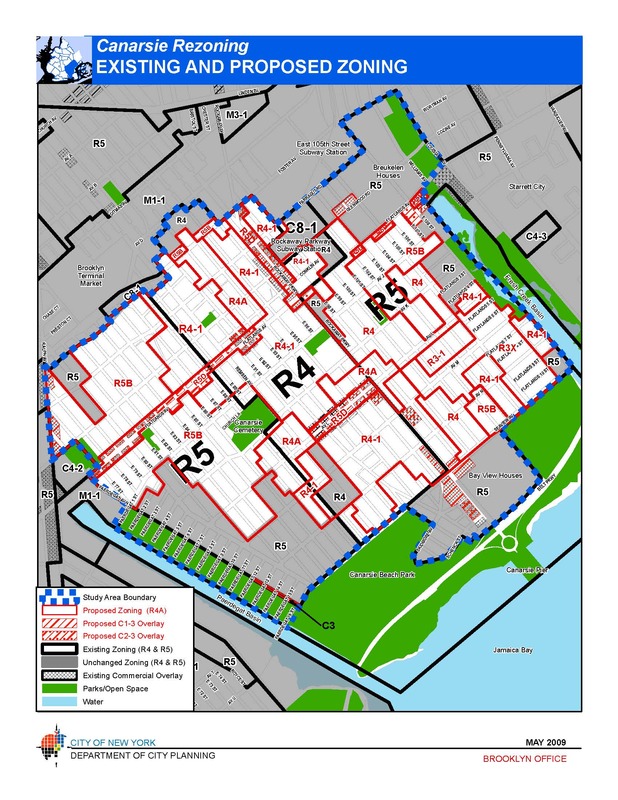 Council: Canarsie Rezoning (June 30, 2009).